Last bit of destashing for just now – stuff that’s ready to wear! Prices are in USD and include shipping to the US and Canada. A light and fun woven scarf featuring super soft, high quality hand-dyed yarns. Turquoise with just a bit of fuchsia in narrow accent lines. Plain weave using Shelridge Farm Soft Touch Ultra (100% superwash merino wool) and Blue moon Fiber Arts Socks that Rock (100% superwash merino wool). This scarf is machine washable, but for best results hand wash, dry flat. 12 inches wide by 84 inches long, including 7 inch turquoise knotted fringe. Was $95, now just $55 USD. 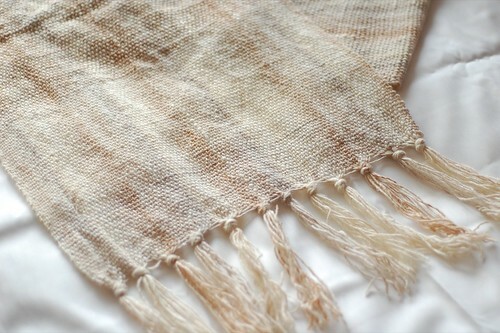 Milk and Cream Scarf – handwoven by me! A light and fun woven scarf/wrap featuring Noro Silk Garden yarn. Whites, creams and beiges shimmer in this wide wrap that scrunches up to wear as a scarf. This self-striping yarn produces subtle, skinny vertical stripes! Plain weave using Noro Silk Garden Sock Yarn (40% Lamb’s Wool, 25% silk, 25% nylon, 10% kid mohair). Hand wash, dry flat for best results. 15 inches wide by 80 inches long, including a 6 inch knotted fringe. was $105, now $75 USD. Galli Tweed Scarf – A long silk tweed scarf featuring high-quality silk yarn. Charcoal with multicoloured tweedy bits. Plain weave using Muench Sir Galli (100% silk tweed). Hand wash, dry flat for best results. 8 inches wide by 80 inches long, including 7 inch brown knotted fringe. was $75, now $50 USD. 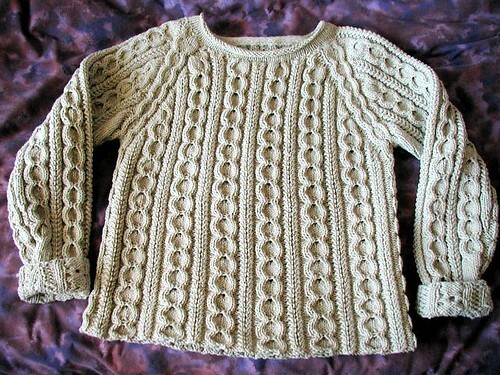 “Cotton Raglan” from Melissa Leapman’s “Cables Untangled”, knit from 8 skeins of O-Wool worsted merino. Worn once or twice, but I made it too big for me! I can’t bear to rip it out. $85 USD, or make me an offer (I won’t be offended if you rip it out for the yarn or something). 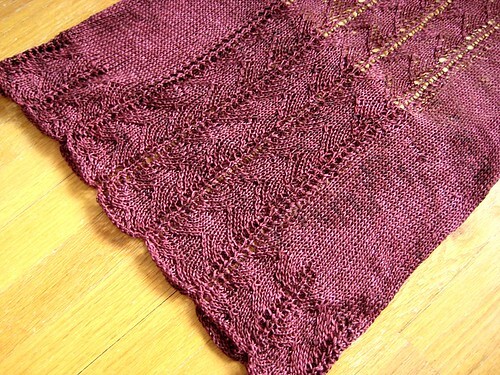 “Lace Nightie” from an old Interweave, knit out of Alchemy Silken Straw (100% silk). Not at all a nightie but a cute layering piece, more of a cami! (Sorry for the old photos – there’s a front view here.) Worn maybe once or twice. The size is a little tricky, it measures 29 inches across the middle but it’s a halter. Shown on me, 36″ bust. I think it’ll fit from about 32-36 inch bust. $50 USD, or make me an offer! 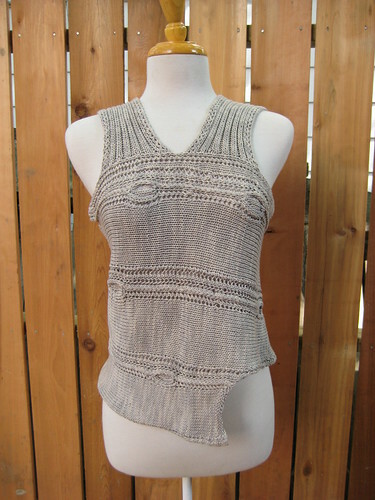 Roundabout Tank from Knitting Nature. 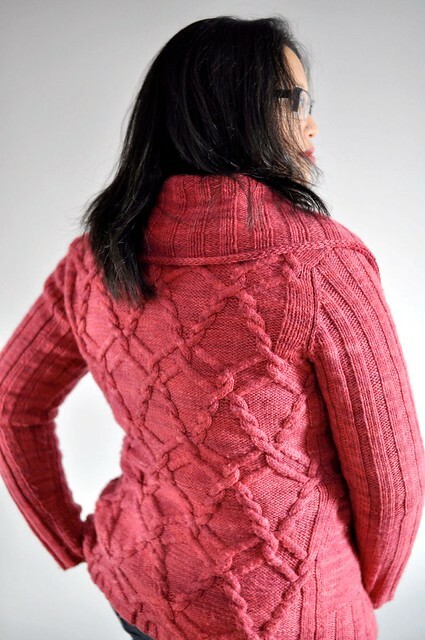 Knit from Nashua Natural Focus Ecologie Cotton. Worn once or twice. Would make a great vest in the fall! Bust is 34 inches. $40 USD or make me an offer! Me! Me! I need that milk and cream wrap! i’m interested in the cotton raglan…could i try it on? I would like to purchase the roundabout tank, please contact me. Thanks. Without a doubt new collection should be called “Pretty in Pink”. Can’t wait to see the patterns published.